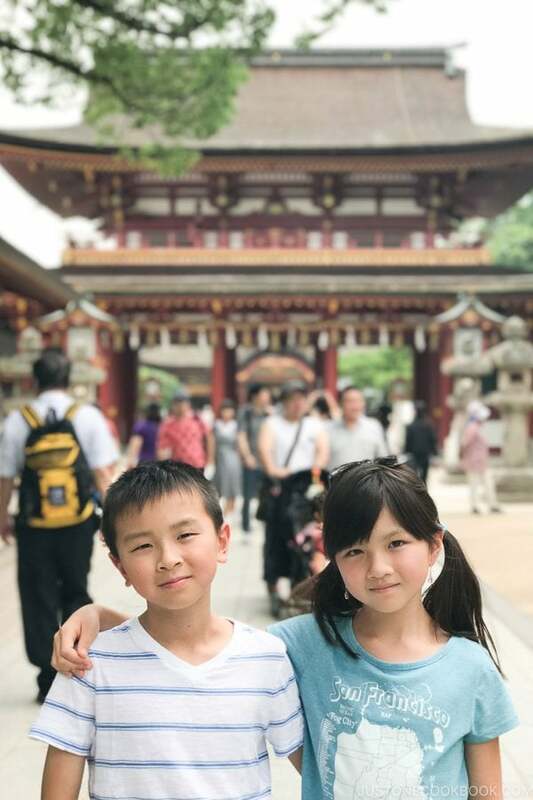 This time around as our children are older, we could actually browse through the restaurant floor and unique shops they had at Tokyo Skytree Town. 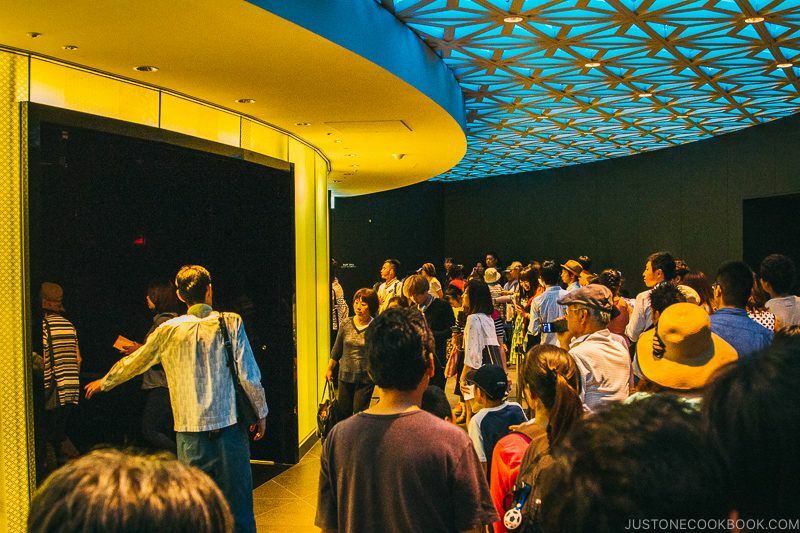 Ready to tour Tokyo Skytree? Let’s go! 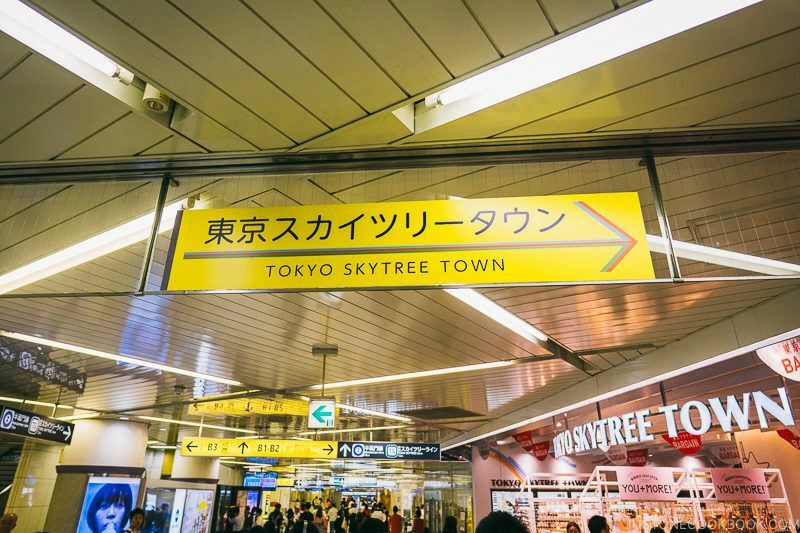 I’ll cover Tokyo Skytree first and then Tokyo Skytree Town. The tower was completed in 2012 and is currently the world’s second tallest building and tallest tower (as of 2018). There are 2 observatory decks you can visit, and you will need to purchase an additional ticket to visit the higher observatory deck (Tembo Galleria) at 450 m (1,480 ft). The elevation of the lower deck is 350 m (1,150 ft). We visited on a warm Saturday afternoon around 2 pm. 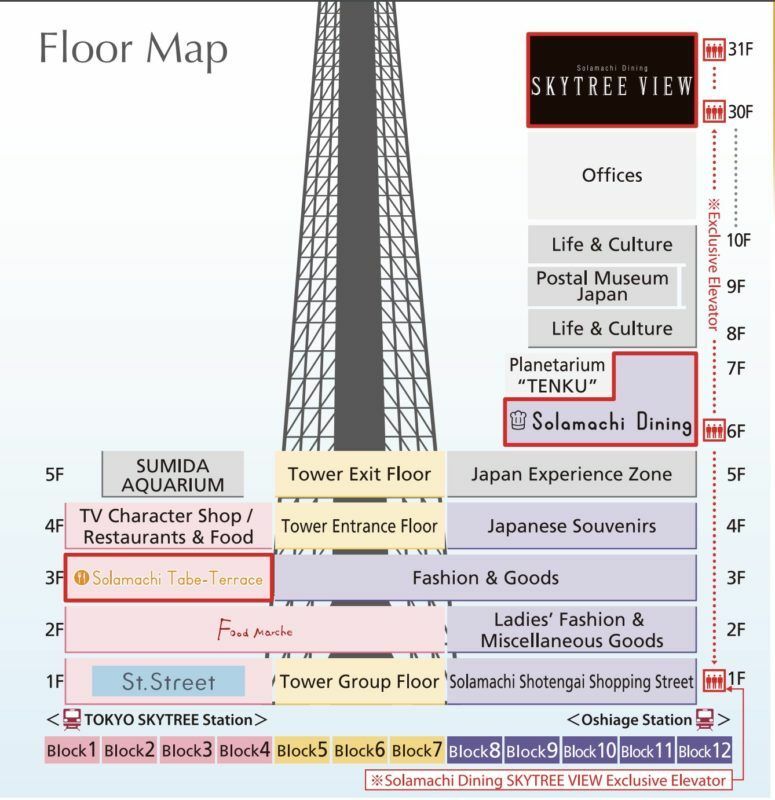 The tower itself is in a plaza called Skytree Town, which also include an aquarium, dome theater, offices, gift shops, and restaurants in addition to the broadcast tower. When we found the line for the observatory, the sign at the end of the line said 90 min wait. It almost made us give up but since we were there already we decided to grind through it and wait it out, just in case the sign was wrong. When we got in line to wait, it actually extended to the outside of the building. After 10 minutes or so, we finally entered the building. 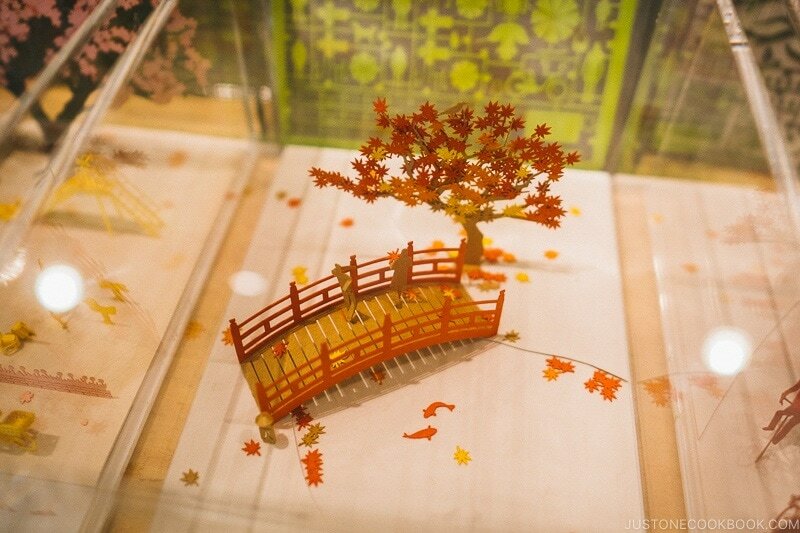 As we looked around, we could see the beautiful display of Super Craft Tree by designer Yukio Hashimoto. You can also see the steel structure that’s supporting the tower from the large windows surrounding room. 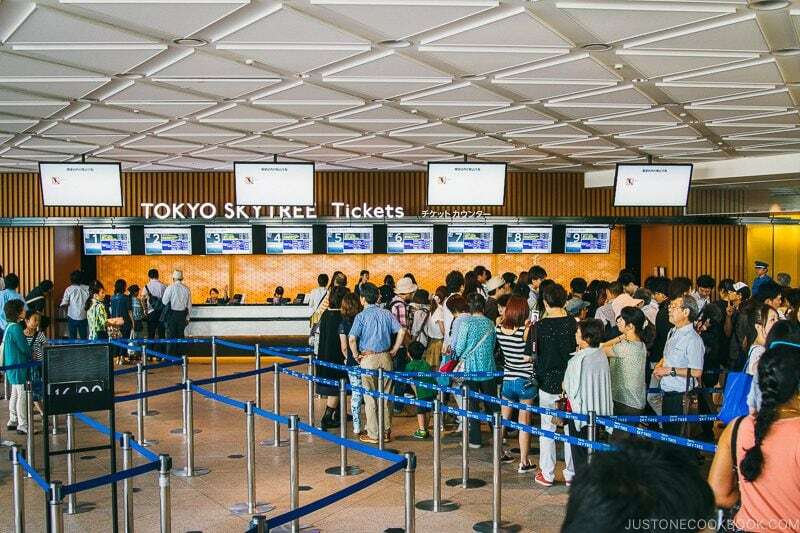 What seemed like an eternity has finally passed, we could hardly conceal our excitement to finally see the ticket counter. 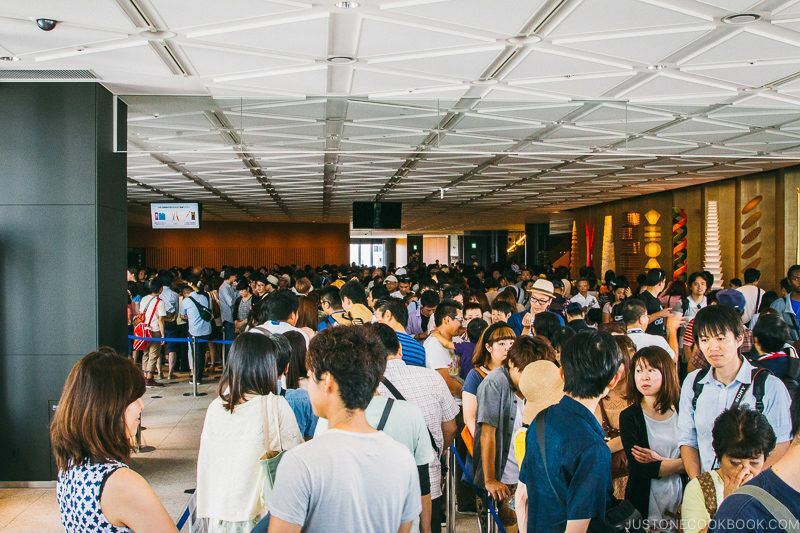 After purchasing the tickets to visit both observation decks, we thought the lines has ended. Not quite, there’s a another short line to wait for the elevators. 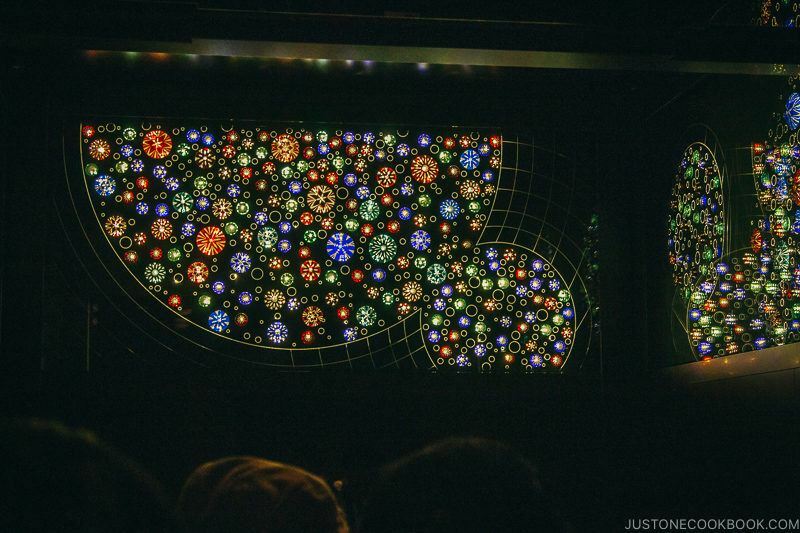 As we enter the elevator and it started to ascend, the lights inside darkened and the ceiling of the elevator had beautiful Japanese patterns that changed colors and brightness. Everyone in the elevator was entertained by the changing lights during the quick ride. The first stop is the Tembo Deck at Floor 350, which also includes with ticket booth to Tembo Galleria and a cafe. 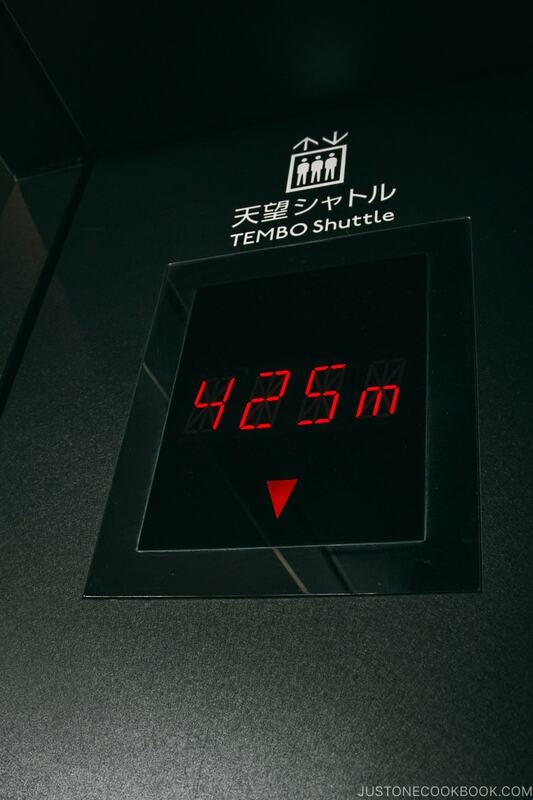 There are 2 more levels, Floor 345 and 340 within the Tembo deck which houses the gift shop, Sky Restaurant, and a cafe. You’ll go through these lower levels as you return to the lobby. We went ahead and purchase the tickets to Tembo Galleria (Floor 445 and 450)to enjoy the breathtaking view. 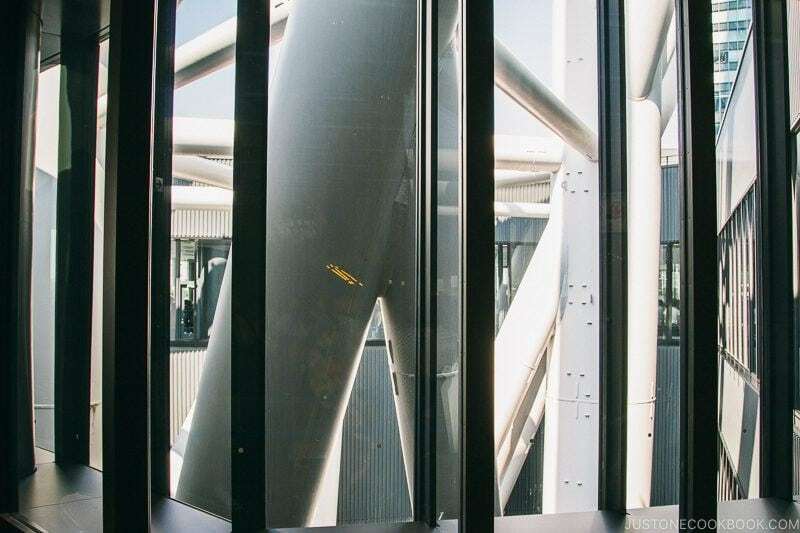 The elevator to the Tembo Galleria is quite thrilling, as you can see through the glass panel doors and ceiling. 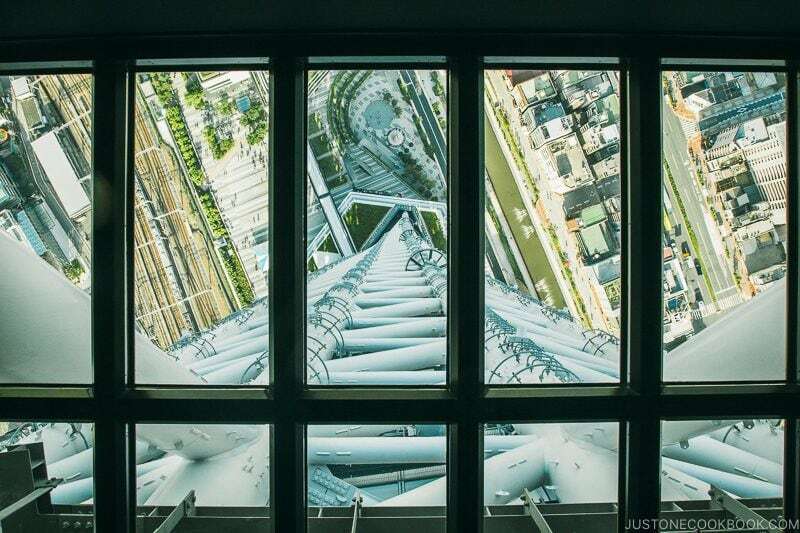 Glass ceiling elevator at Tokyo Skytree. As we exit the elevator at Floor 445, the children squealed with delight and enjoyed the views. The elevator leads to a ramp to Floor 450. Blast from the past, Nami and the kids in 2014. 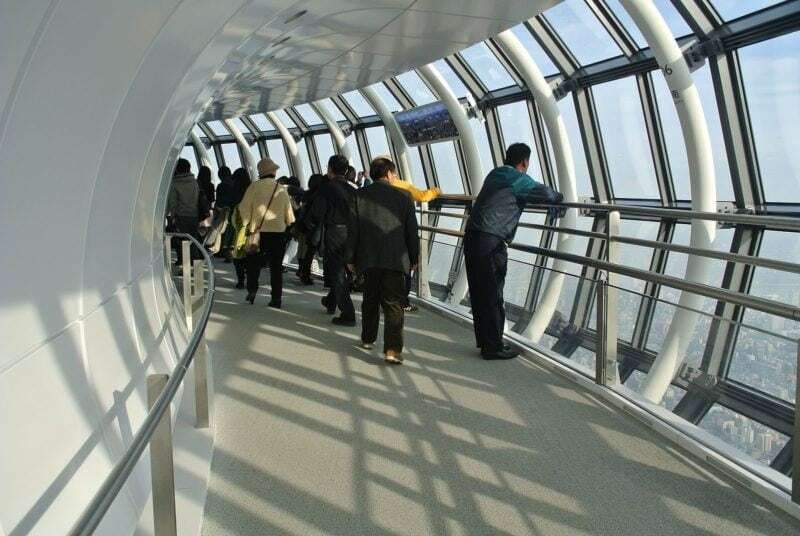 From the top of the tower and along the ramp, visitors get the unobstructed view of Tokyo. 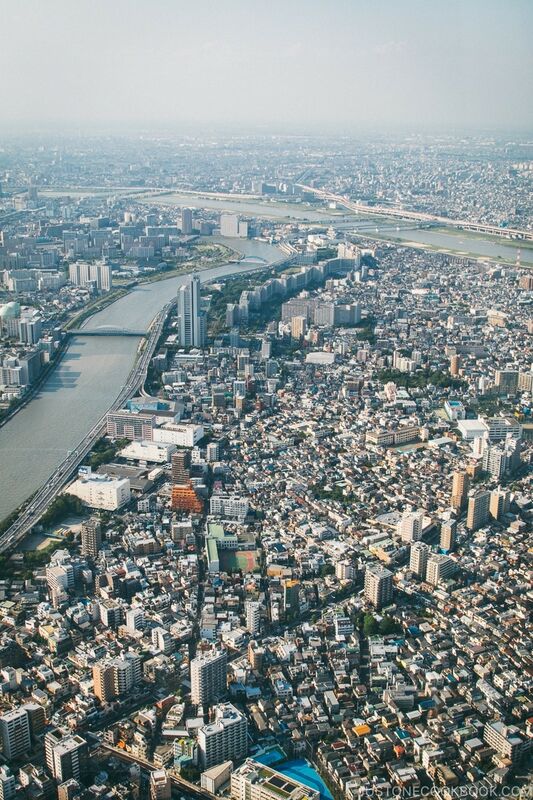 View of Tsukishima from Tokyo Skytree. It’s incredible as all the tall buildings now look like as if they were made of small Lego bricks. 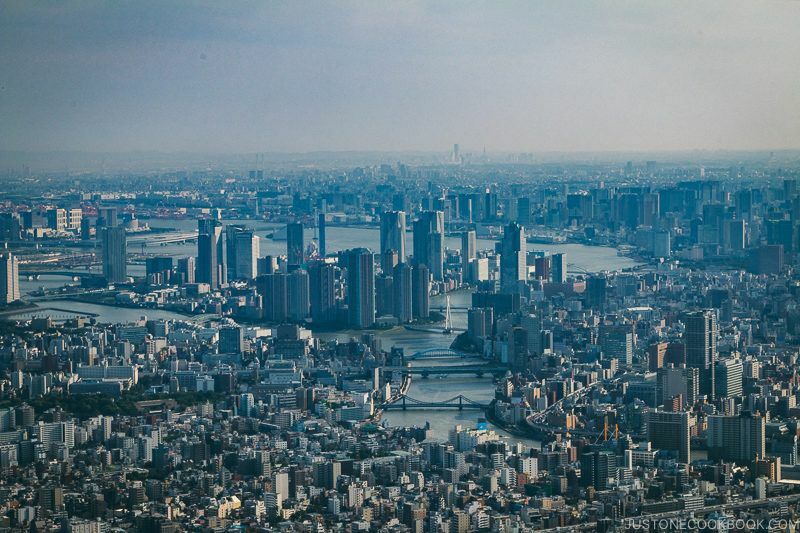 View towards Tokyo Bay and Disneyland from Tokyo Skytree. 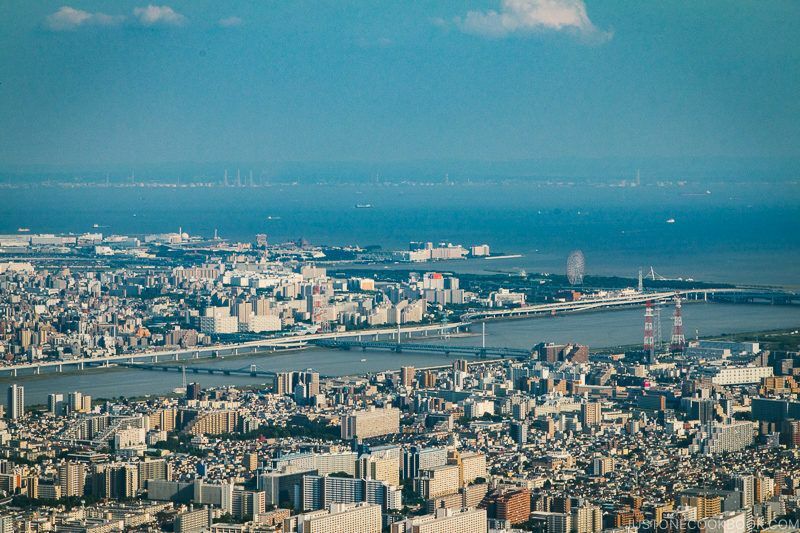 You can see Tokyo Disneyland and DisneySea in the direction of Chiba City. 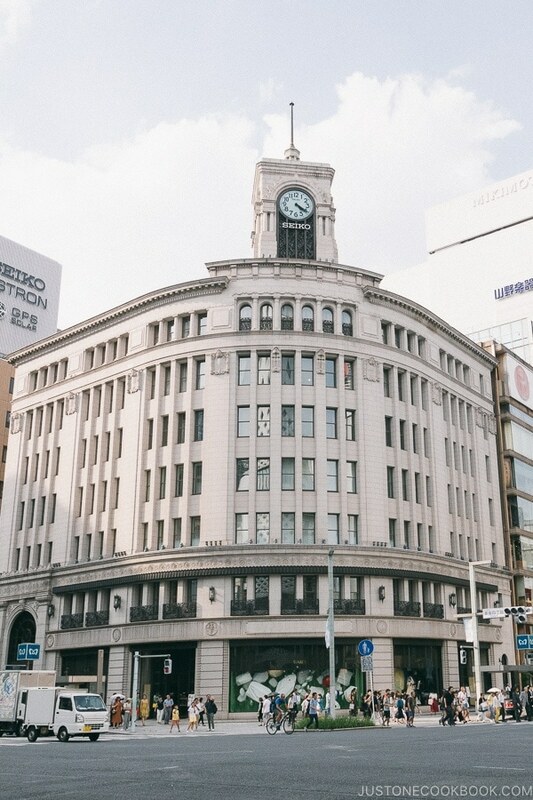 Other recognizable structures we could easily see are Tokyo Dome, Tokyo City Gov’t Building, and Tokyo Tower. 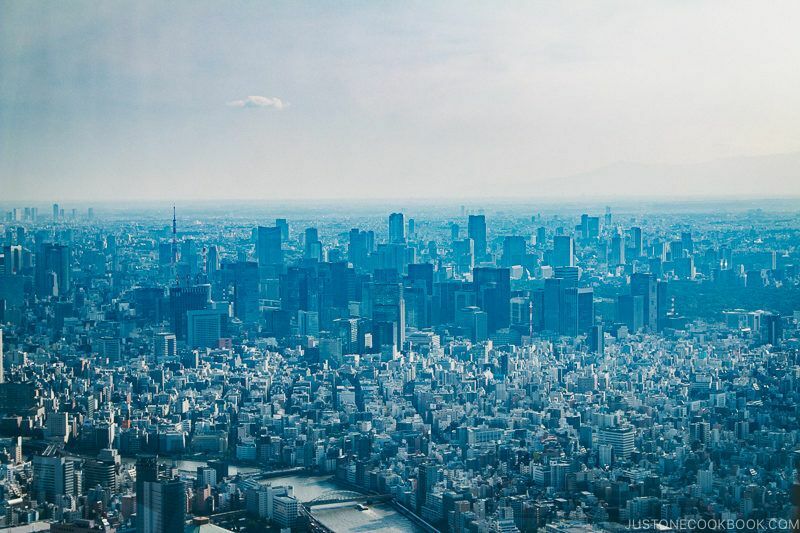 View towards Shinjuku from Tokyo Skytree. View towards Tokyo Station and Tokyo Tower from Tokyo Skytree. After spending some time seeing the different sights, it’s time to head down. 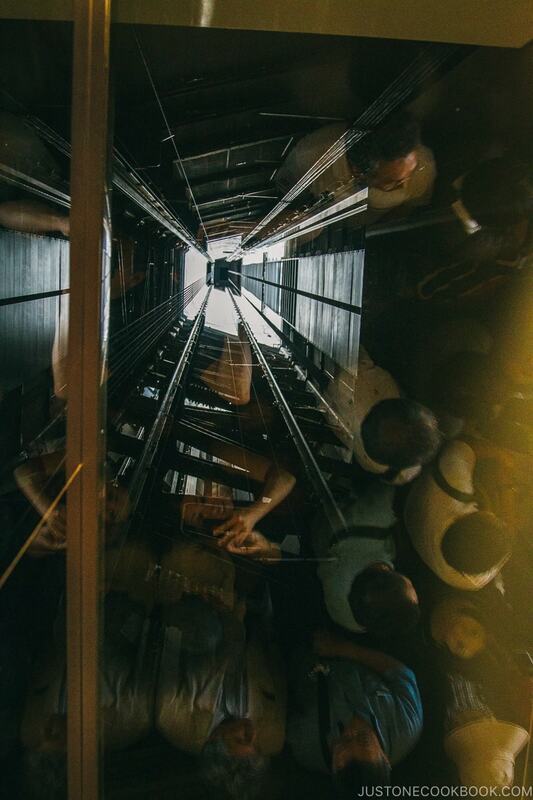 One of the coolest features as you journey towards the lobby is the glass floor on Floor 340. It’s a bit nerve-wracking but definitely very cool to be able to look down. It was a memorable experience and we had a great time despite the super long wait. 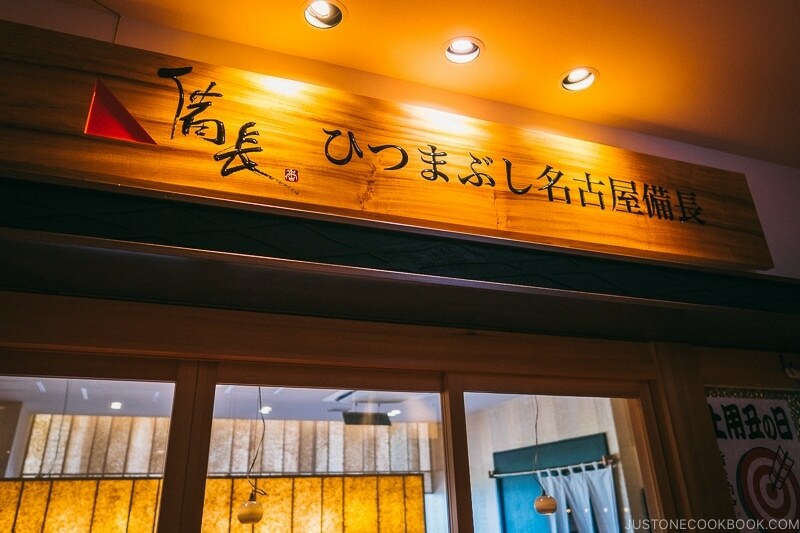 The purpose of our visit this past summer (2018) to Tokyo Skytree Town is so we can eat at Toriton sushi. 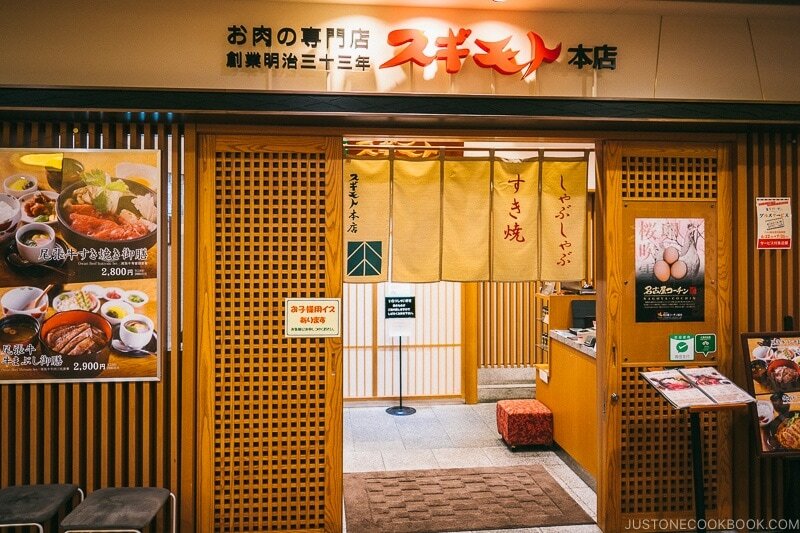 It’s a Kaiten sushi (sushi boat) restaurant that’s from Hokkaido. 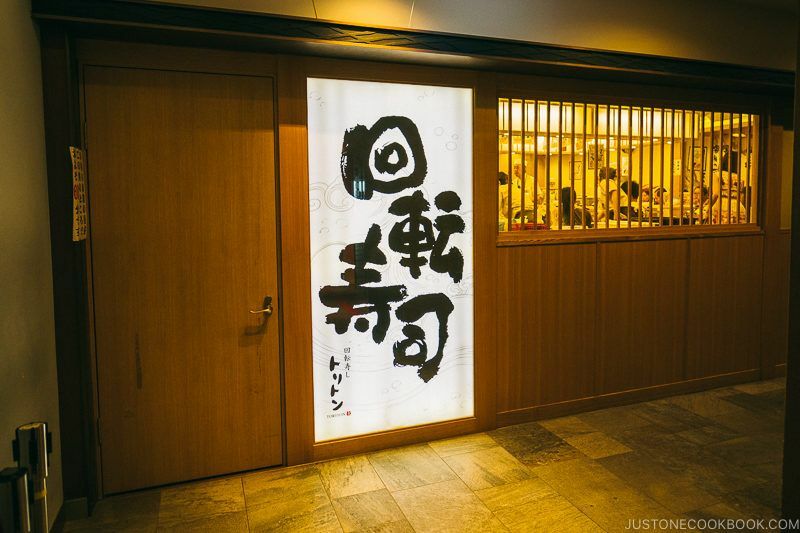 We had such an amazing meal in Sapporo years ago we couldn’t wait to go back when we found out it opened in Tokyo. 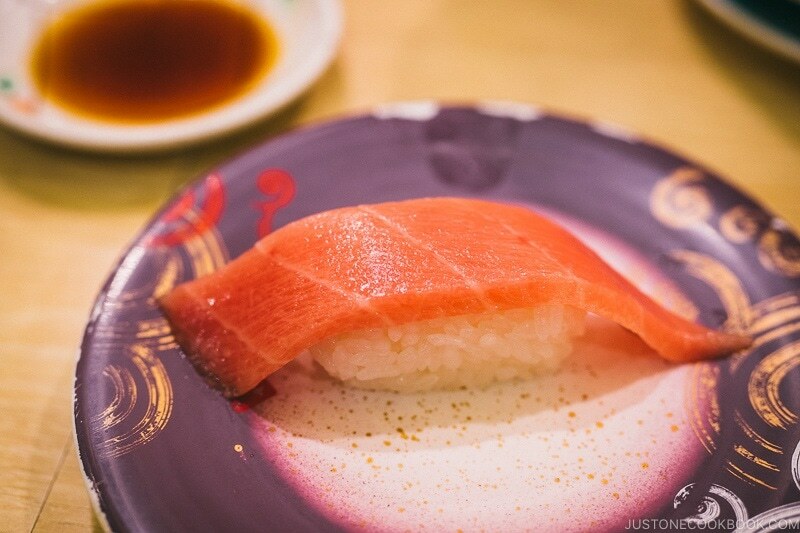 Sushi at Toriton is not “fine dining” sushi but it’s very affordable and tasty. 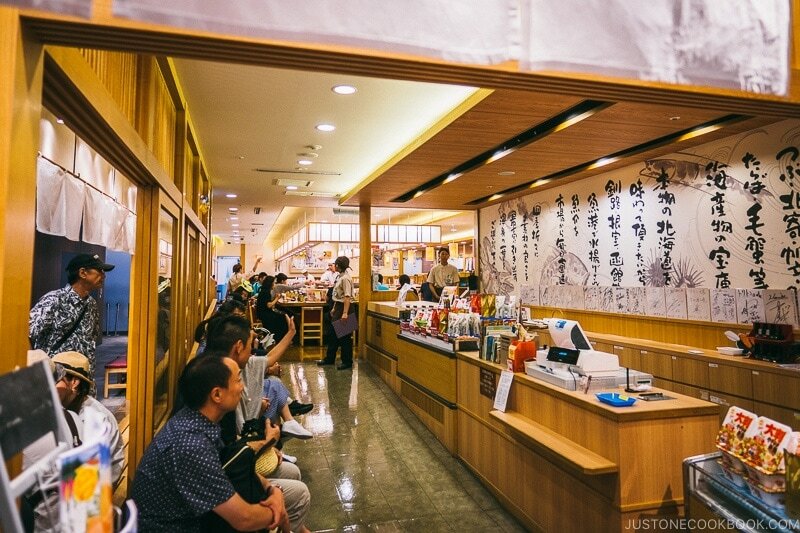 Toriton is a sushi chain and they have 13 restaurants in Hokkaido and 2 in Tokyo. The quality of their seafood is much better than most conveyor belt sushi restaurants and the ratio of fish to rice is very generous. We arrived at Toriton at 11:30 am and the restaurant was already completely full and there were about 10 people ahead of us in line. Luckily we were able to get seated in about 15 min. 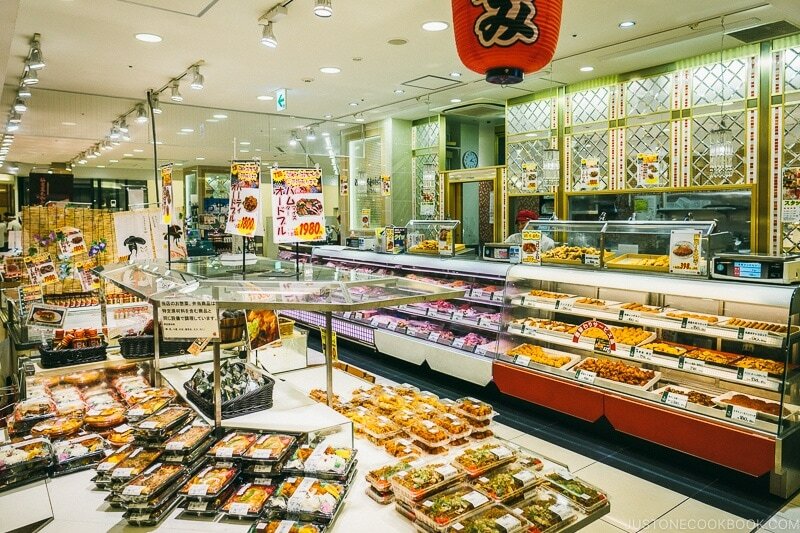 If you’re not familiar with conveyor belt sushi restaurants (aka sushi boat resturants), they are all over Japan and prices are affordable compared to traditional sushi restaurants. 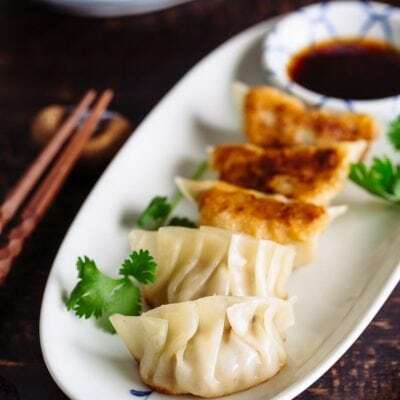 Each plate range from $1.50 – $6 dollars depending on the type of fish or food. 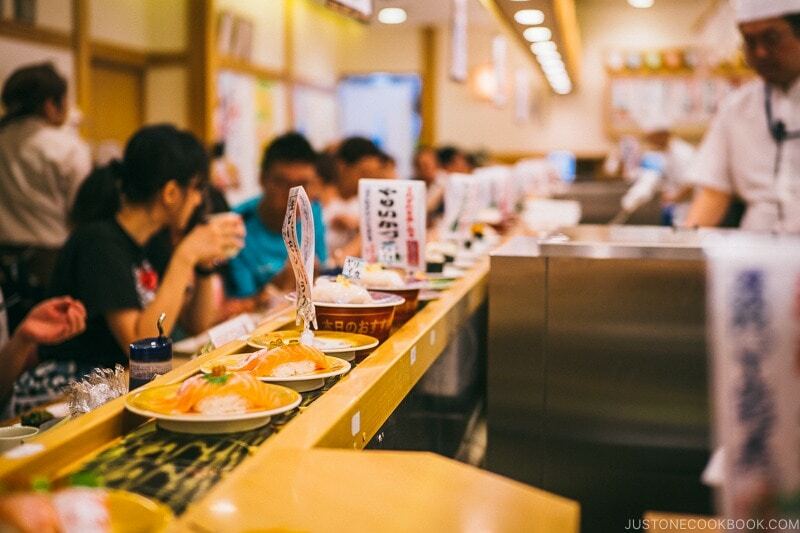 You can read more about conveyor belt sushi restaurants here. 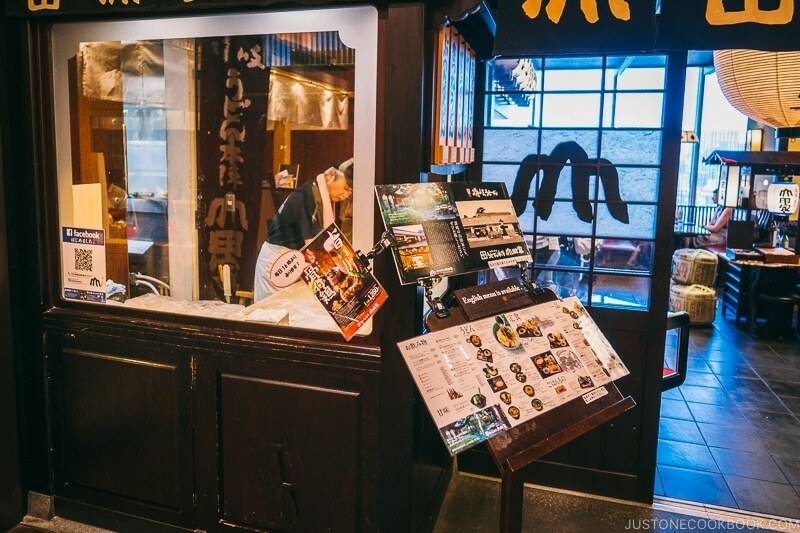 You can select the premade sushi you want off the conveyer belt or order what you like on a small slip of paper from the staff directly. 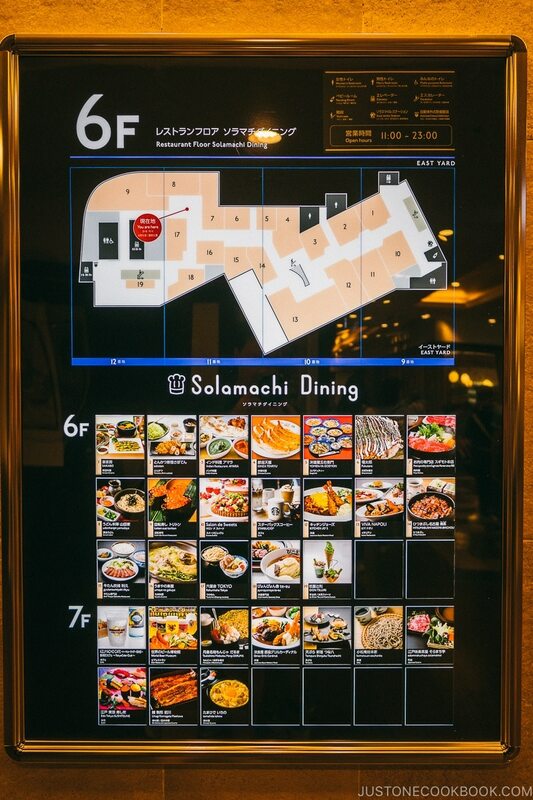 The newer sushi boat restaurants have a digital menu on ipads and you can even select language of your choice, whether you want wasabi or not, and whether it’s for children. If you select the children option they’ll cut each sushi in half. 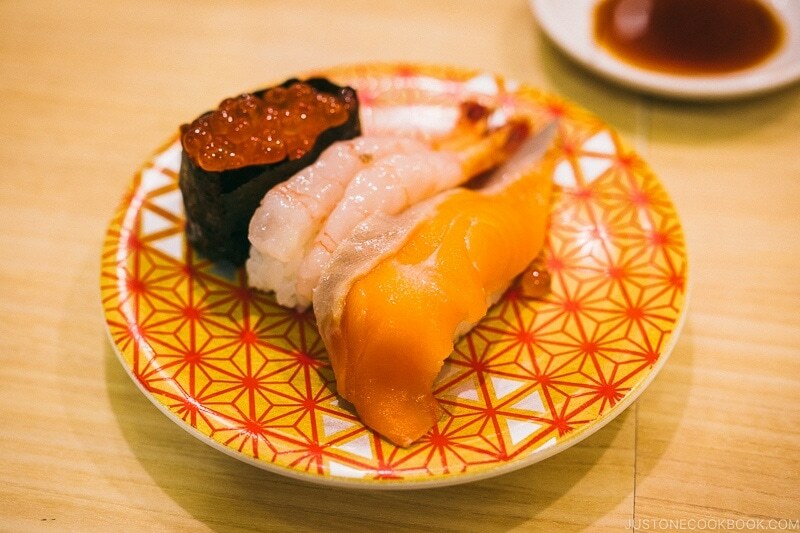 Salmon, shrimp, and ikura sushi. 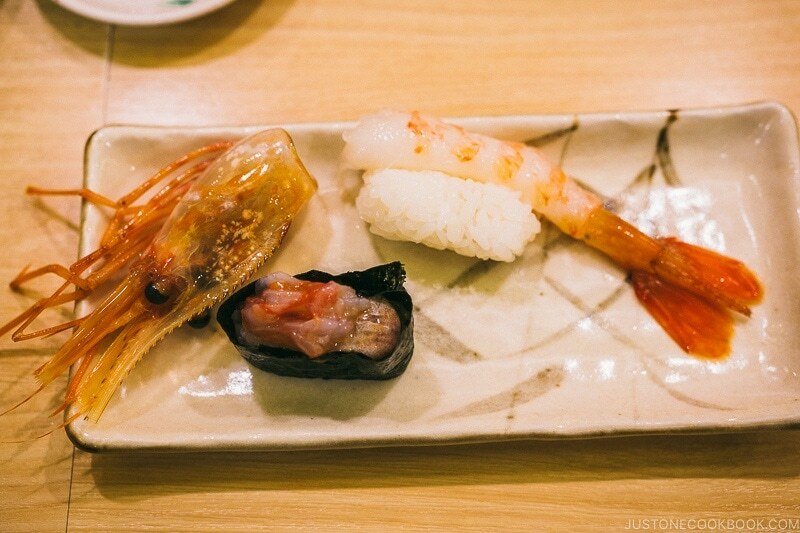 The sushi quality was outstanding and we were stuffed. 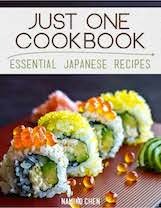 The cost came out to $15 a person for our family which is much cheaper than eating sushi around San Francisco. 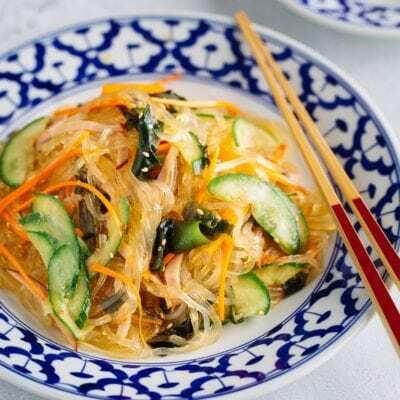 Not a fan of raw fish? No problem there are a ton of dining options to choose from. 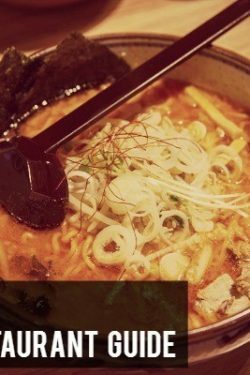 Besides Toriton, there are many other popular restaurants in the same area, including sukiyaki, shabu shabu, gyoza, and unagi restaurants. 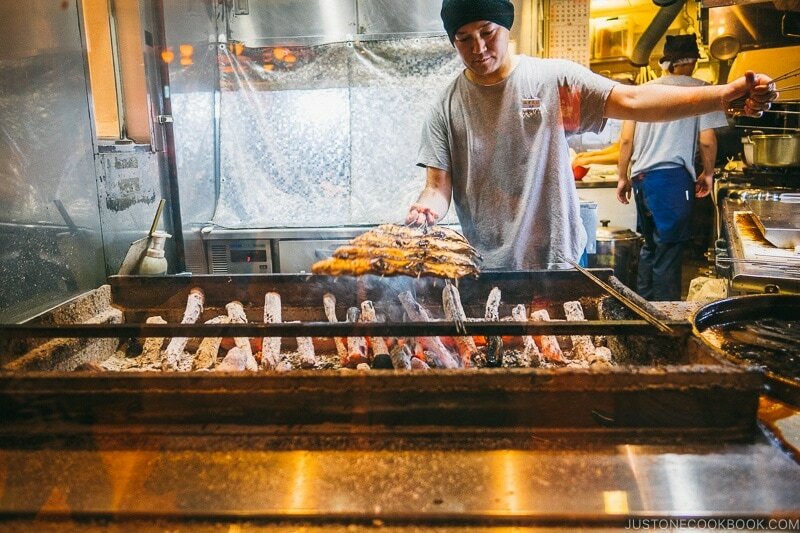 Unagi being grilled over charcoal. 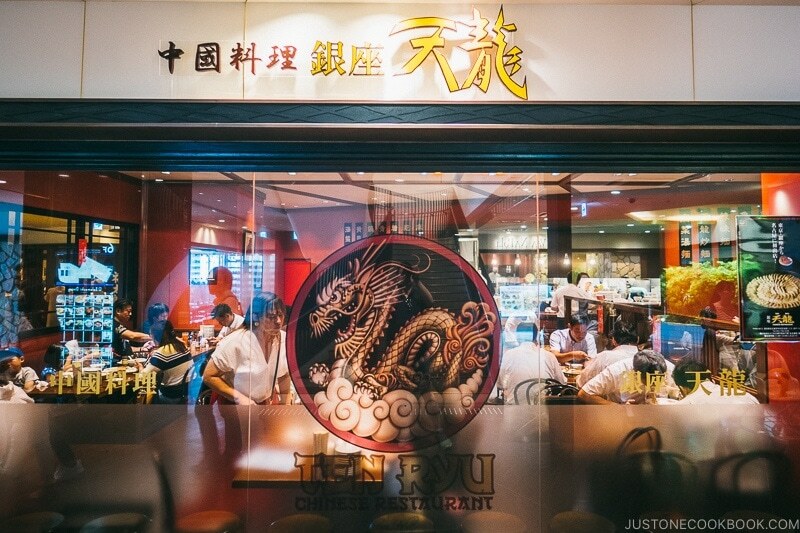 There’s also a branch of Ginza Tenryu Chinese restaurant which we tried in Ginza. 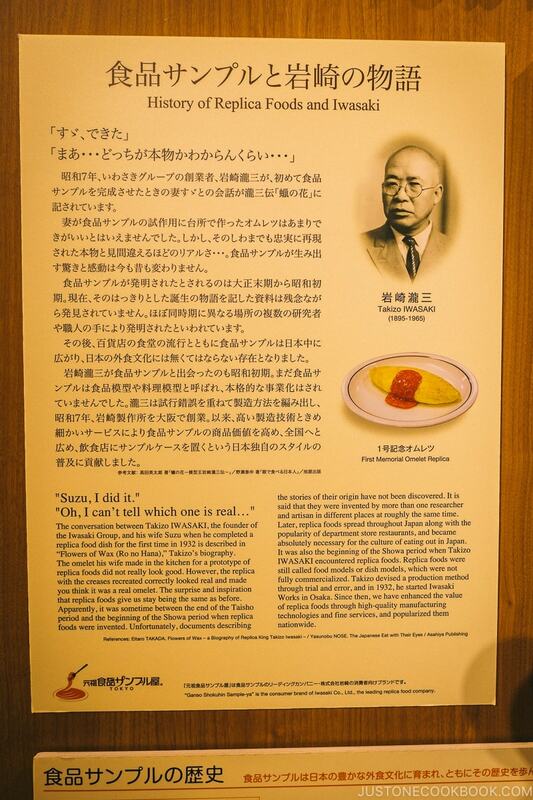 Udon Honjin Yamada house Tokyo. 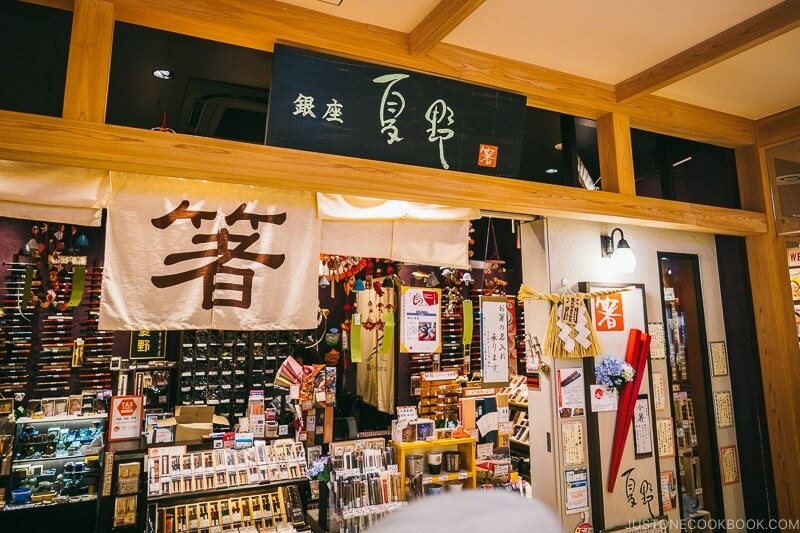 Besides the many yummy restaurant selections, on the 4th floor, there’s a selection of shops that carry unique Japanese souvenirs. 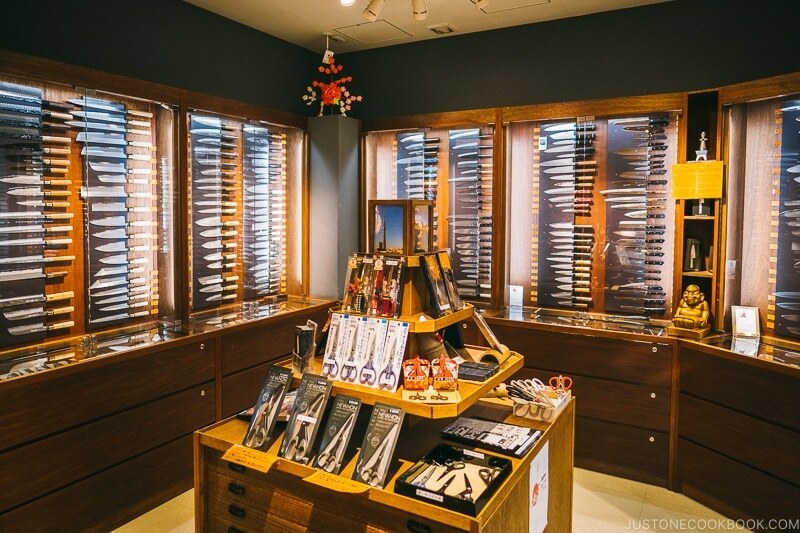 Chopstick store at Tokyo Skytree Town. 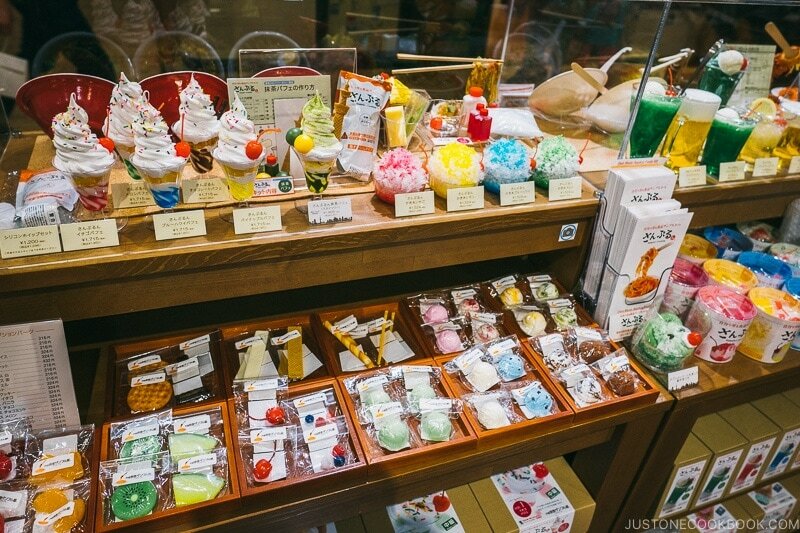 One of the shops even sells replica food, similar to what you would find in Kappabashi Dogugai. 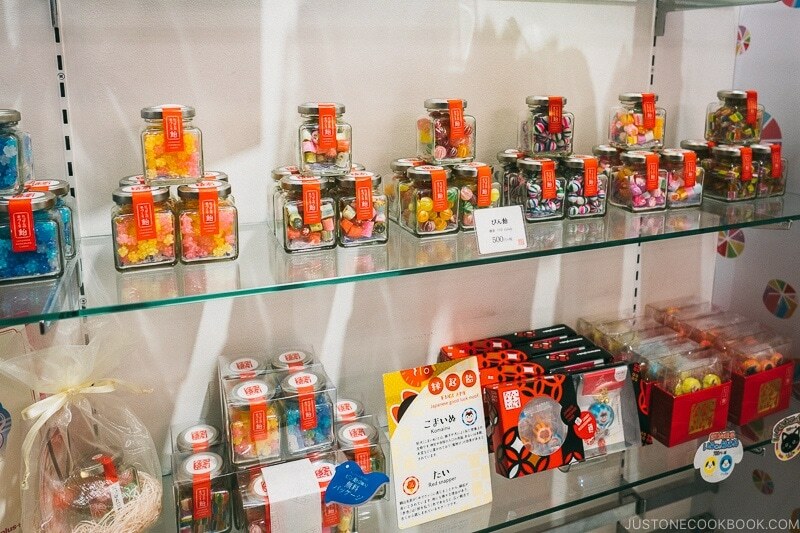 Nippon Candy Project at Tokyo Skytree Town. 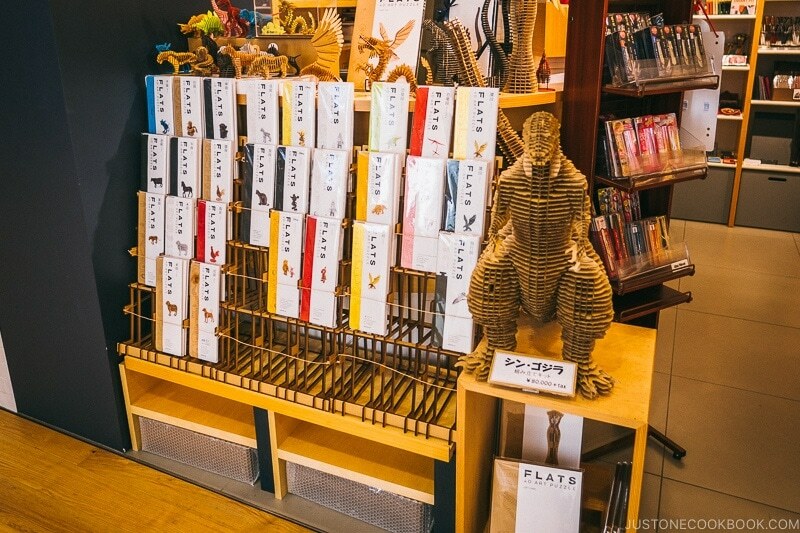 How about bringing home a cardboard statue of Godzilla and other ceratures? 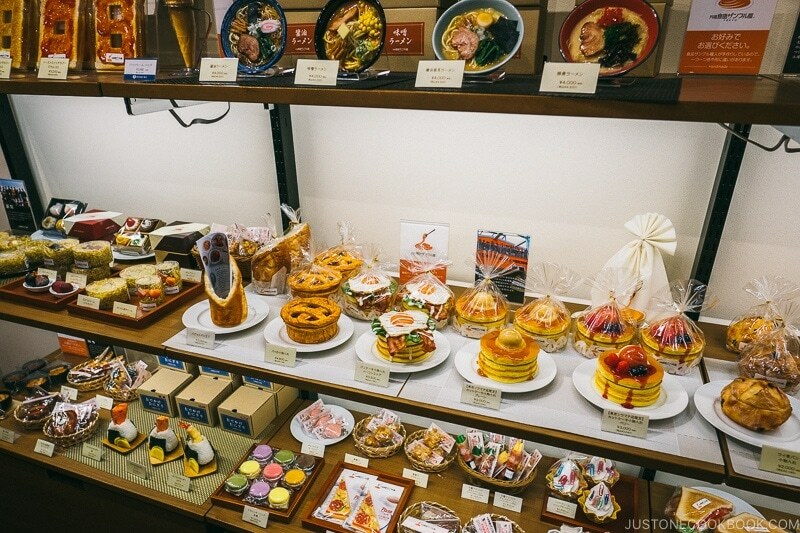 Besides restaurants, you can also shop for food, clothing, fashionable goods, etc in Tokyo Skytree Town. 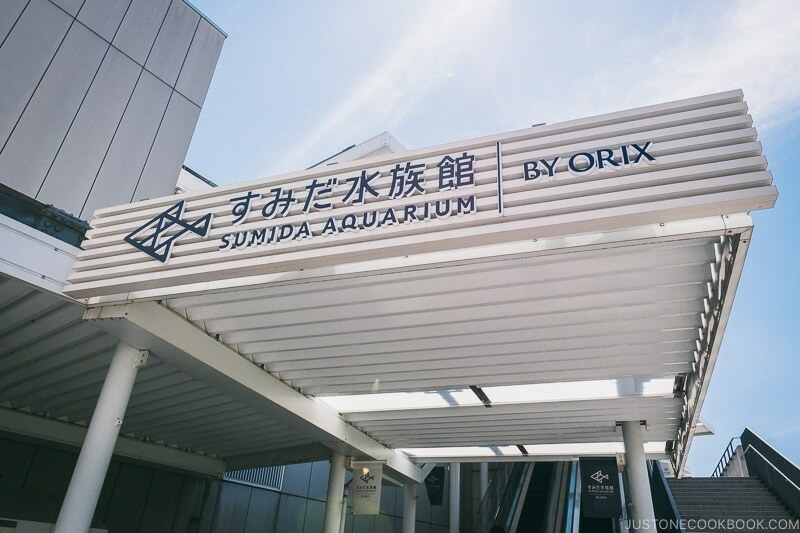 Lastly, if you have little ones who are bored from all the sightseeing, they might be interested in Sumida Aquarium. It is not large compared to other aquariums in Japan but should keep younger children entertained for hours. Our son espeically love aquariums and we try to visit them whenever we go to a new city. 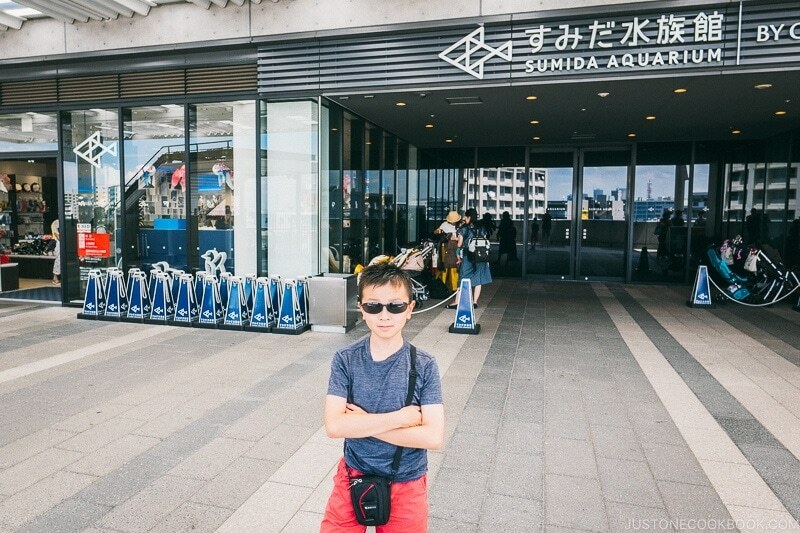 Sumida Aquarium at Tokyo Skytree. Our children after running through the misting machine 10 times to cool down. 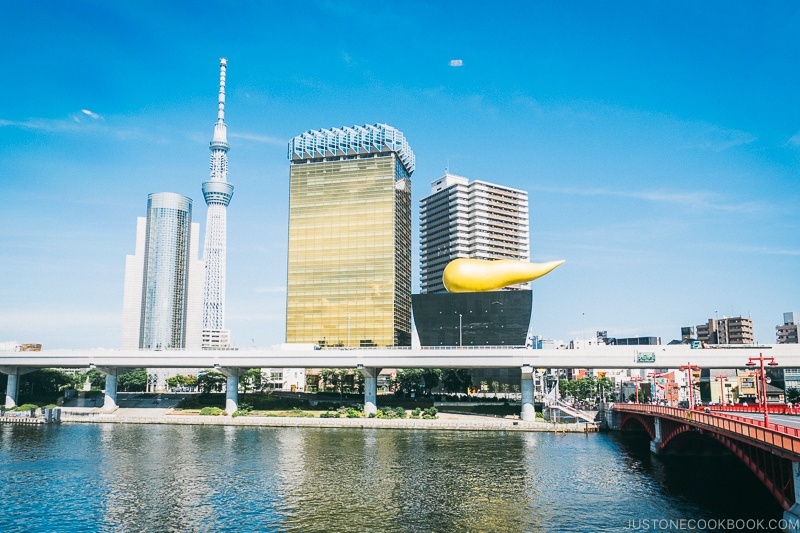 Thank you for reading our Tokyo Skytree Guide and hope you find it helpful and entertaining. 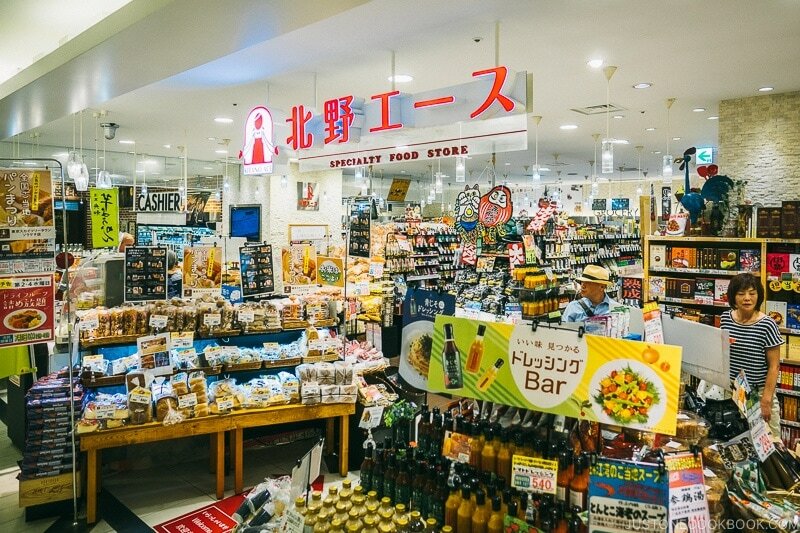 Many of my friends are not able to fit in their itinerary when they go to Japan but I hope you can stop by to check out this really cool area. If you are interested in the rest of our 2018 Tokyo Series, here are the links below. 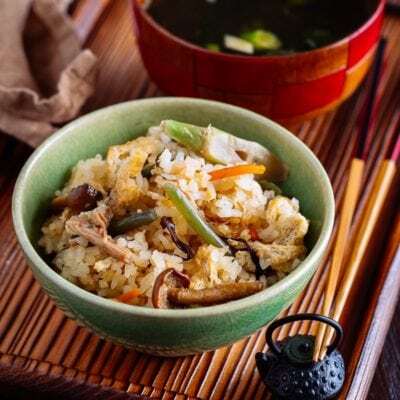 If you want to check out our travel tips, read 8 Top Travel Tips for Your First Time Visit to Japan. 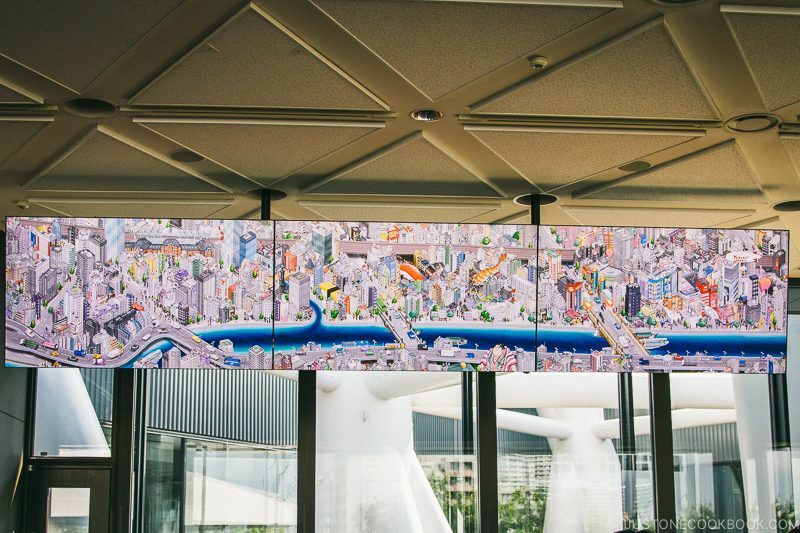 I loved seeing Skytree photos again! We were there in October of last year and got almost the same photos as you. 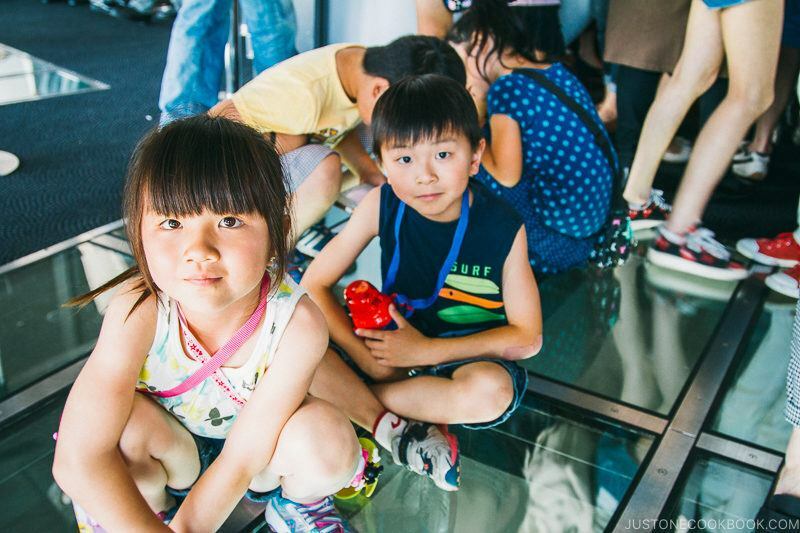 The glass floor was the big attraction–some students were jumping on it! Yikes! 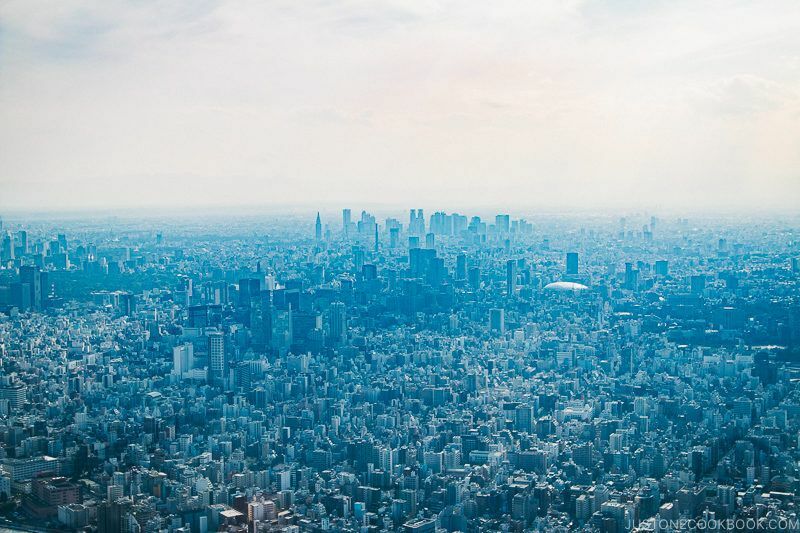 Honestly this is my next vacation stop, Tokyo. Love the photos! Feel like I was there myself. 😉 Too bad about all that dust, but it’ll be so worth getting new ceilings! Hello Nami! 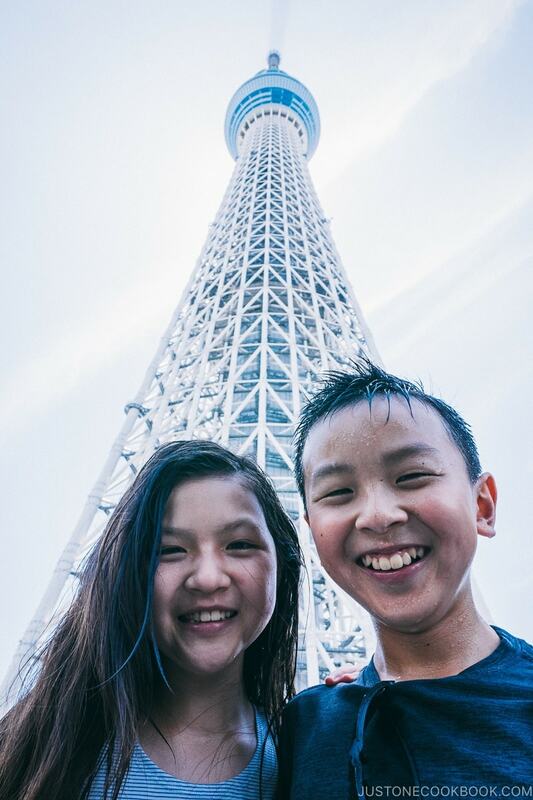 We visited the Skytree on our Tokyo trip in October of 2014. I thought it was one of the coolest sights to see and loved every moment. When the elevator doors opened on the Tembo Deck and we walked out to the windows, I felt like we were on an airplane that had taken off! I am amazed at the engineering involved and that the design is so attractive as well. While up on the Tembo Deck, walking up the the top, we heard a series of announcements on the PA in Japanese. I didn’t understand any of the words and no one around us looked concerned so we just kept walking. Eventually an English announcement came on and kindly let us know that the fire alarm was a false alarm and there was no fire. Whew! 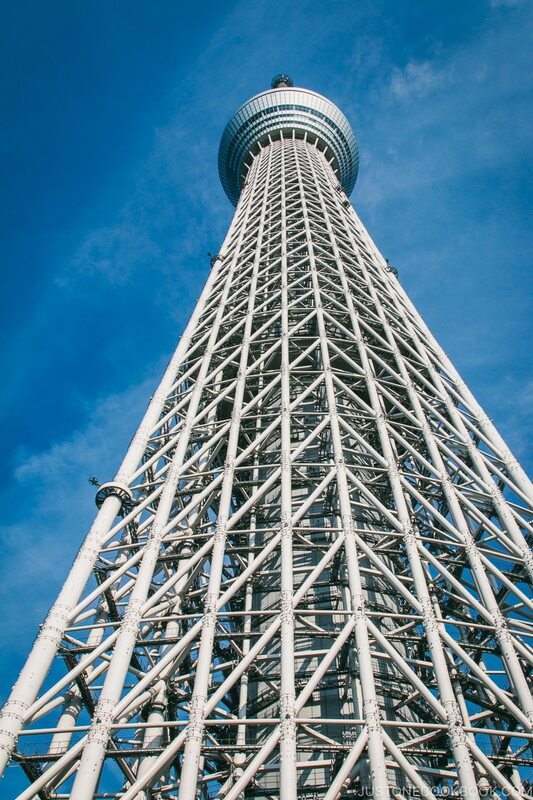 I can’t wait to visit the Skytree again and look forward to getting to explore more of Japan outside of Tokyo. Thank you for sharing as always. Hi Todd! 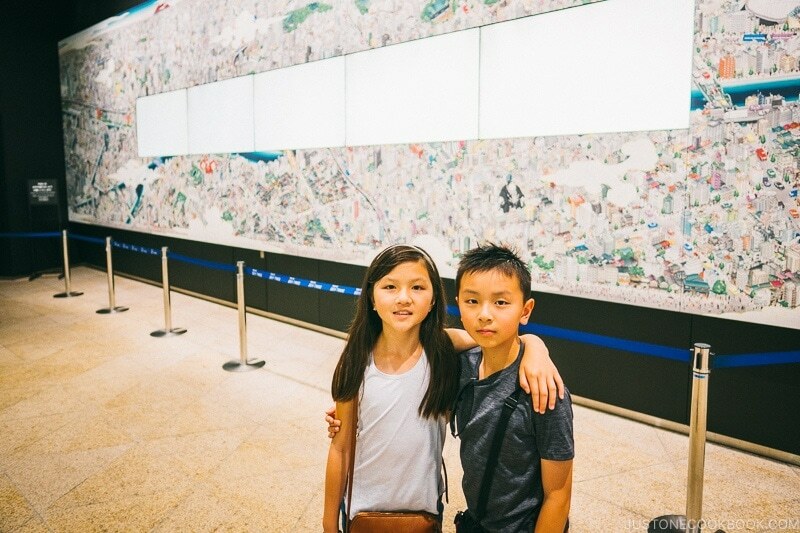 It’s great that you two could visit Tokyo Skytree! 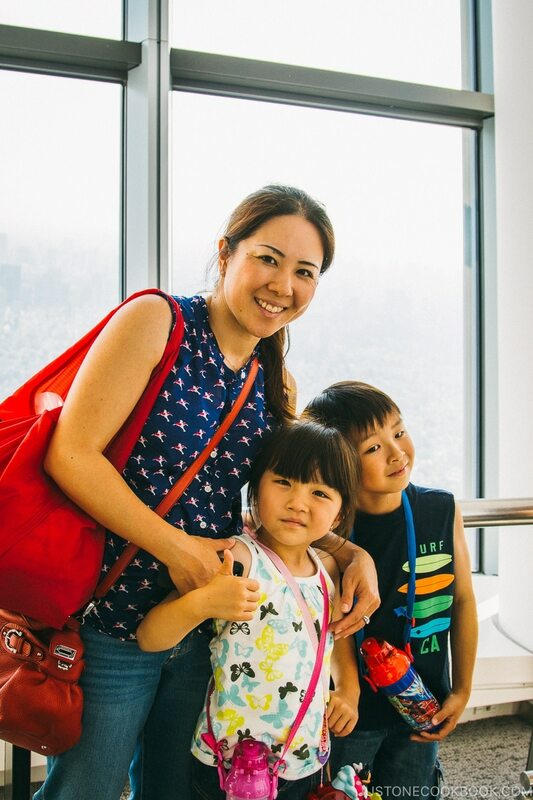 We had fun, and it was nice for kids to see the city of Tokyo from up high. Haha, how funny the announcement was about false fire alarm! Good thing it wasn’t the real fire. I can’t imagine how we would escape… I would be too scared to go down with stairs!! Leaving for Japan in 2 weeks. Can’t wait to share more of our Japan adventure with you! 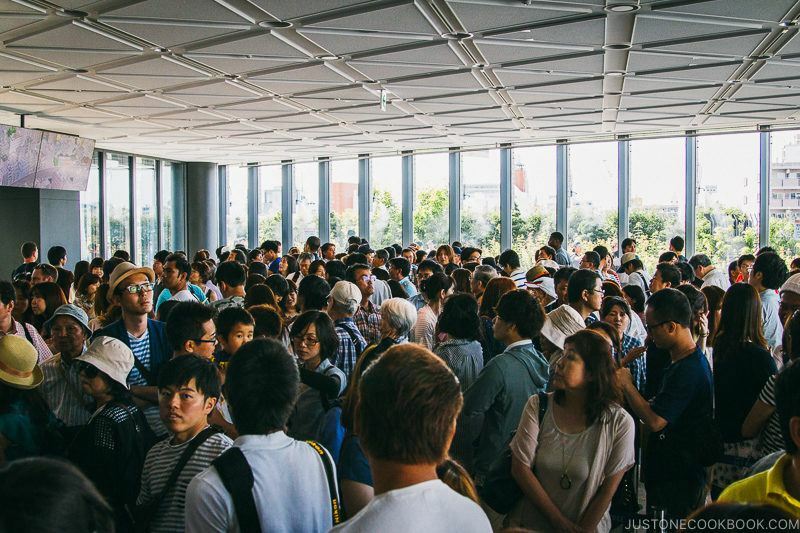 Here are my favorite shots from the Skytree. 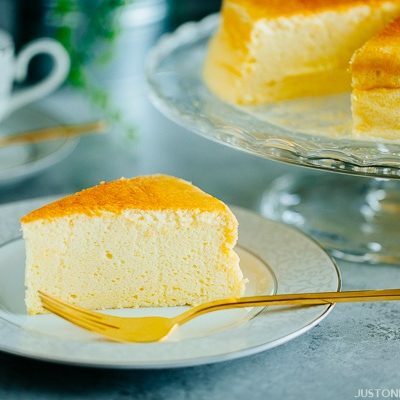 I hope it’s ok to post some photo links here. Hey, you were in Japan! I hope you had a nice visit. Awesome photos! 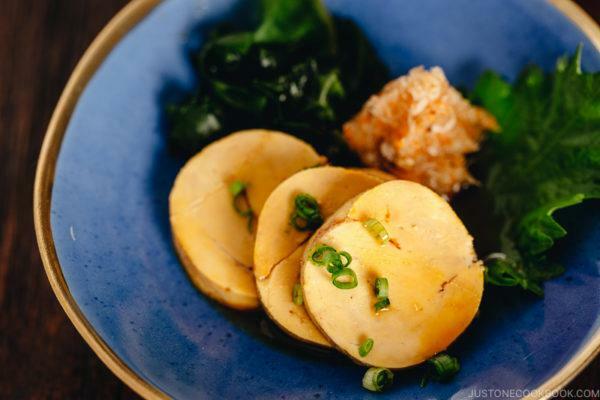 I hope you didn’t forget to stock on yuzu kosho. Hi Margot! 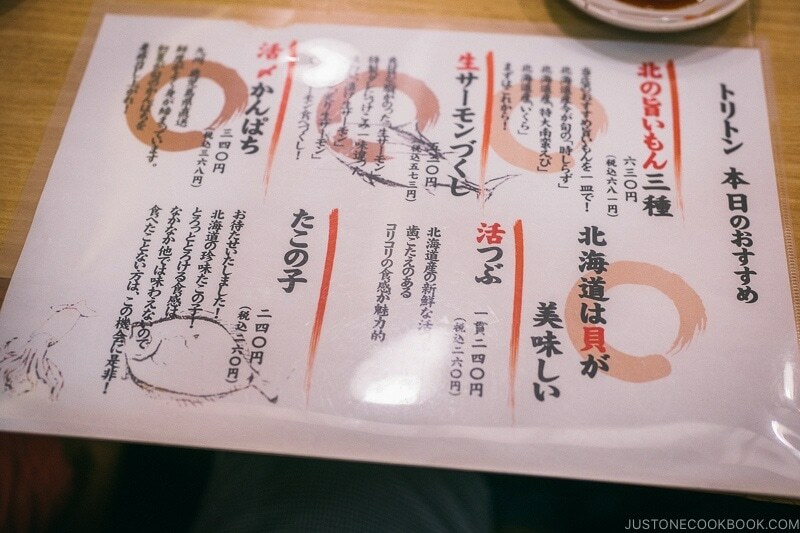 This was from last June… I know it took me FOREVER to write this post… >_< I'll be in Japan in 2 weeks. Yes, so many things to stock up! I can only imagine how beautiful this is in person! What a fun thing to do and the view is simply gorgeous. 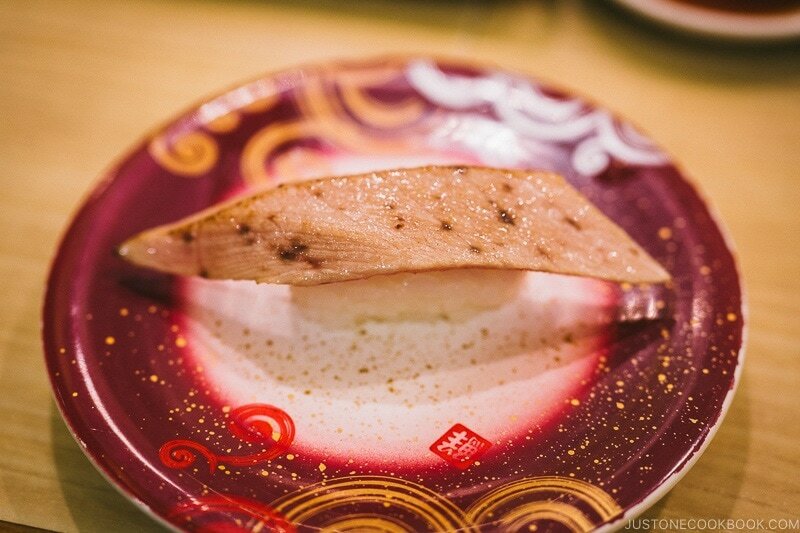 You made me want to visit Japan again! My last visit was many years ago and I always wanted to go back again! What a building! The engineering to build such a thing is incredible. Thanks for the tour! Oh those darn popcorn ceiling – so ugly and what a mess to get rid of. I’m bet you’re glad to see it gone. How did the popcorn ceiling removal go? I can’t wait to hear about your new kitchen. You so deserve an upgrade. 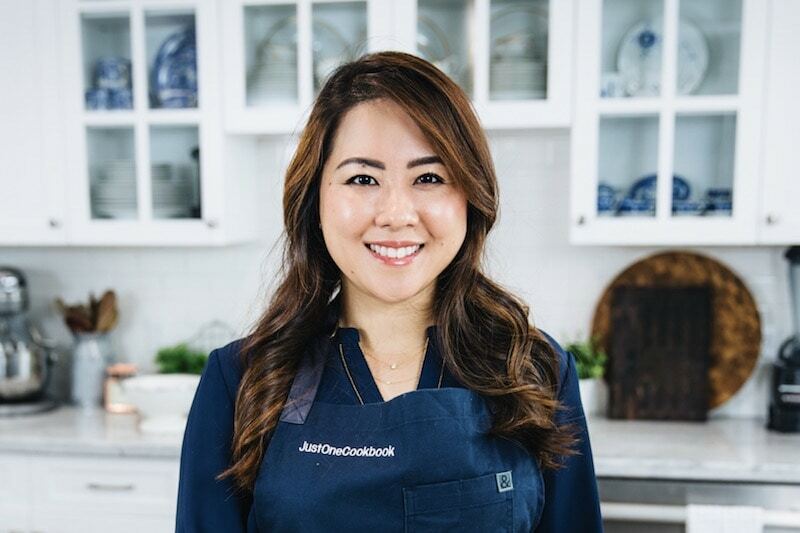 Will you be installing a fish oven? 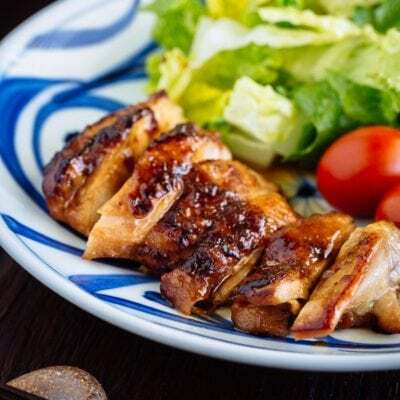 I loved that when we lived in Japan, you just put a little water in the pull out tray and it steams at the same time it grills the top of the fish, loved that little device. 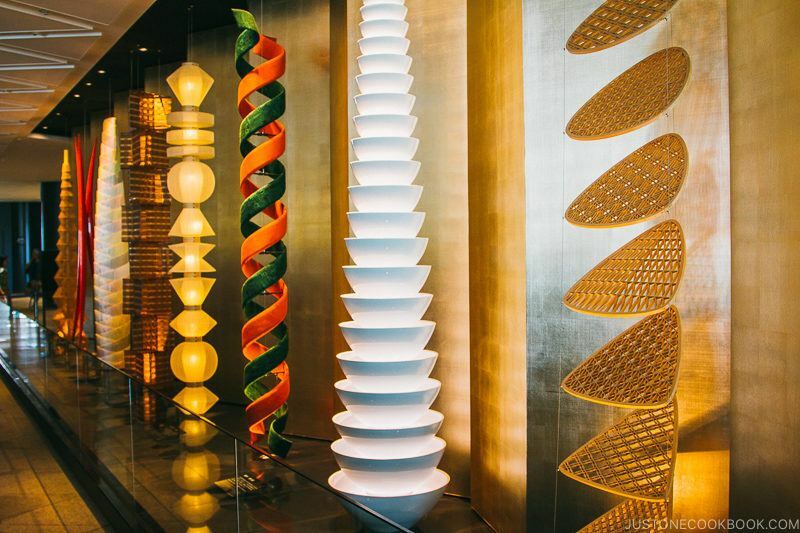 Great photos of the tokyo skytree! I can’t believe the difference in the smog levels from my photos 7 years ago. Must be coming from my neck of the woods… LOL Good luck with your renovations and take care. Thank you for one more Tokyo touristic episode. 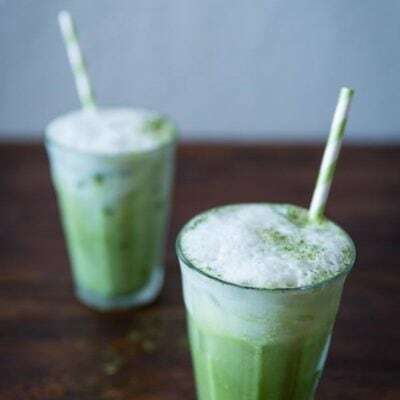 I had a choice: go to Tokyo Skytree or to the Moomin café… I chose of course Moomin café 😉 and haven’t been back in this part of Tokyo since then… I see I must go back! The view seems amazing. Finally getting a chance to go thru your recent posts on you trip to Japan and pinning them for future reference. ? I love reading about your trips! I live right under Sky Tree, just two blocks south in a large apartment complex. Sky Tree is all lit up for Christmas these days, so pretty! 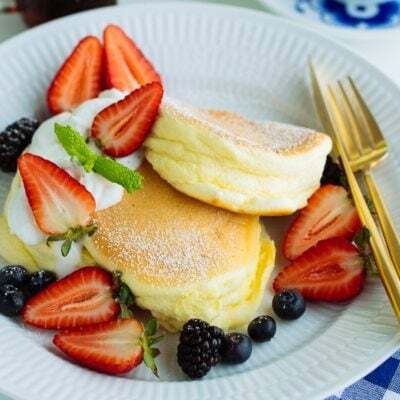 I enjoy your blog and recommend it to my US friends. Thanks! 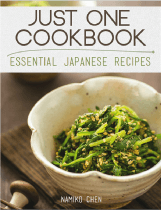 Thank you for reading our blog, any neighborhood gems in the area not in guidebooks you would recommend to JOC readers? 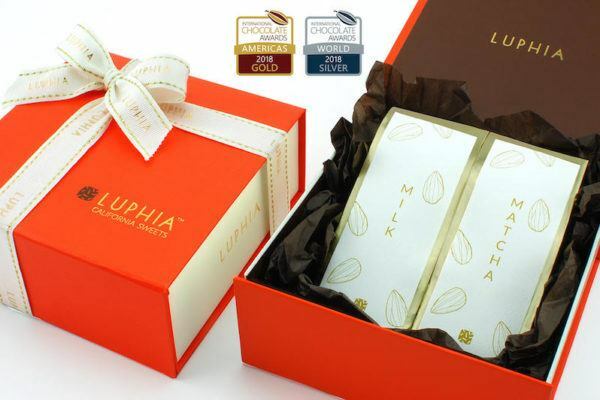 I wish your family a joyous Christmas time. 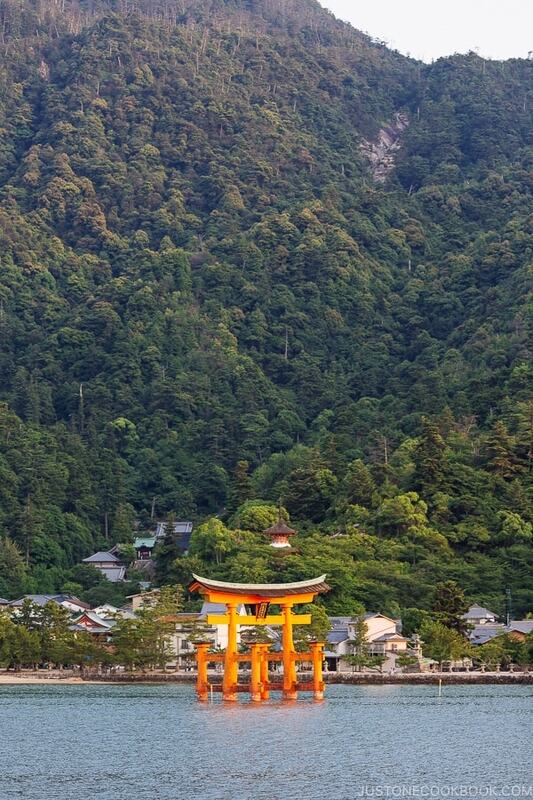 Lucky you, being in Japan for the festivities. I will be there in Jan for the Quilt Show in Tokyo, my 4th trip and wishing to be able to stay longer than a long week. I live in Woodland and would like to know if you ever do public appearances. 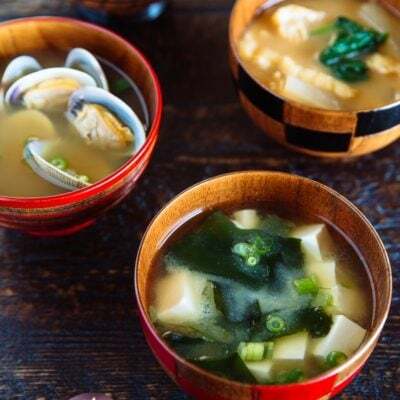 SF is not that far away, or might you consider a class at Food Coop in Davis? Hi Marlene! I just found your comment today by accident, and I’m sorry we somehow lost your comment notification at first place. We had a wonderful holiday time with my family in Japan. Hope you had a great holiday too! I am not very good at public presentation etc in front of big crowds (even YouTube has been quite a challenge! ), but if you ever plan to come to SF or Peninsula where I live, please let me know. I’ll be happy to meet you for a coffee!